Today was a long day, but it was extremely humbling, rewarding and educational. Early in the morning at around 6 am there was a group of about six people that planned to go to a church service. They took the tap tap to the Mass only to find out that there wasn’t service until 8:30 am because of the Feast of the Assumption, so they prayed with a sister for 15 min and then walked back to the Healing Haiti guesthouse. Eventually the time came around for breakfast at 8 am. We ate an egg scramble, French toast, avocados and mangoes. It was delicious! We left at around 9:30am to go to our first location called the Missionaries of the Poor. There we met Brother Simom, a brother with the mission here in Haiti. He talked about his life’s story and about the Mission. He is originally from Kenya. The founder of the Missionaries of the Poor came from China and moved to Jamaica. This is where he witnessed 154 people die and felt God’s calling to serve the poorest of poor and the sick. 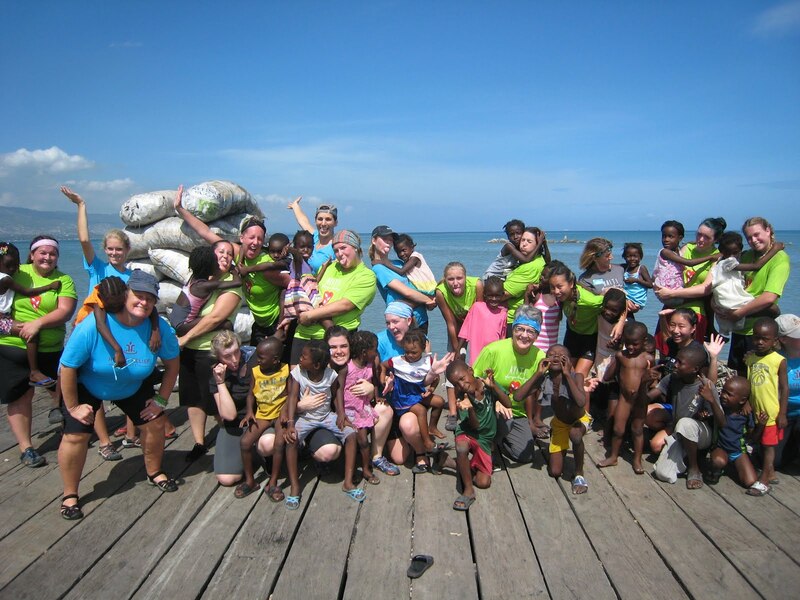 The Haiti site was originally run by Food for the Poor then it was given to the Missionaries of the Poor. There are many Brothers around the world, about 500 of them, and twelve locations of the Mission in Jamaica, Haiti, Philippines and Uganda. We spent the morning bathing, nurturing , playing and loving these beautiful children that live at the Mission. All of the kids had both mental and physical disabilities; it was evident the staff did their best to care for them but as with many situations in Haiti, resources are limited. From there we traveled to an open metal market where we admired and purchased beautiful works of metal art by local artists. 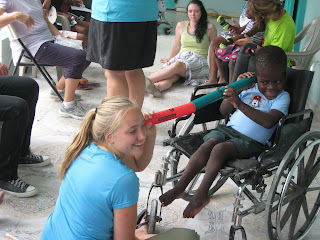 Our last stop for the day was another special needs orphanage. We brought several wooden cars and markers for the children to use. There were also colorful noise makers which were definitely a hit. Many of the kids loved coloring the wooden cars and the masks. There was an impromptu sing along with the noise makers that involved some 90s rap, Frosty the Snowman and the theme song to the Brady Bunch. All kids were in great spirits. One little girl was very particular about the colors that she chose. While another boy found it funny to fling cars and see how far they landed. Lastly, we were greeted by a small boy in a wheelchair that looked at each one of us as we arrived and slowly pointed his index finger and motioned us over. The smile on his face was able to get every single volunteer to come over and say hello. It was a smaller group of kids the second time due to it being summer but the joy filled the hall way in which we played. As we left, each volunteer felt the kindness and joy that each child bestowed upon us. We ended the day in prayer and we are thankful for everything God has given us and everything we were able to give back. 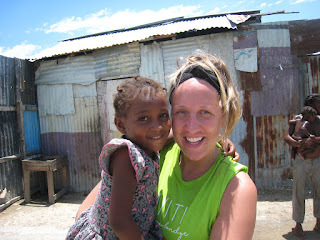 Getting on the plane en route to Haiti in anticipation for a week of challenges and overwhelming feelings... But you know what they say... You truly can never grow until you’re pushed outside of your comfort zone. All of the emotions will be felt while in Haiti... Feeling tears come on from all the abandoned children. Feeling the rage of anger take over from all the social injustices. And the engulfing feeling of anxiety from a completely new experience. However, throughout all of this, God will always be right by our side. It is in this time that we must place faith in the fact that the Lord will bless us and keep us. He will shine His face upon us and use each and every one of us as a vessel for His testimony and purpose. This morning dawned with a sunrise that filled the skies with a pink hue that seemed to wash over the landscape. These quiet precious moments were a much needed inspiration for the day that awaited our team. The amazing thing about God is that when his morning glory greets us from the sky no matter where you are or what impoverished conditions may surround you, bathed in his glow, everything is beautiful. In fact, after today myself and several other team members have seen God’s beauty here. 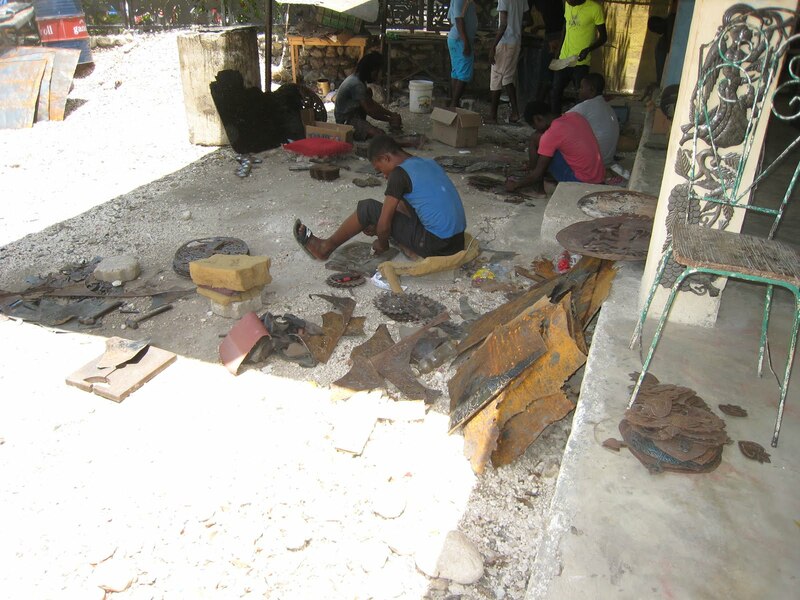 It has been a hard beauty for sure...buried in the trash heaps of Cite Soleil. 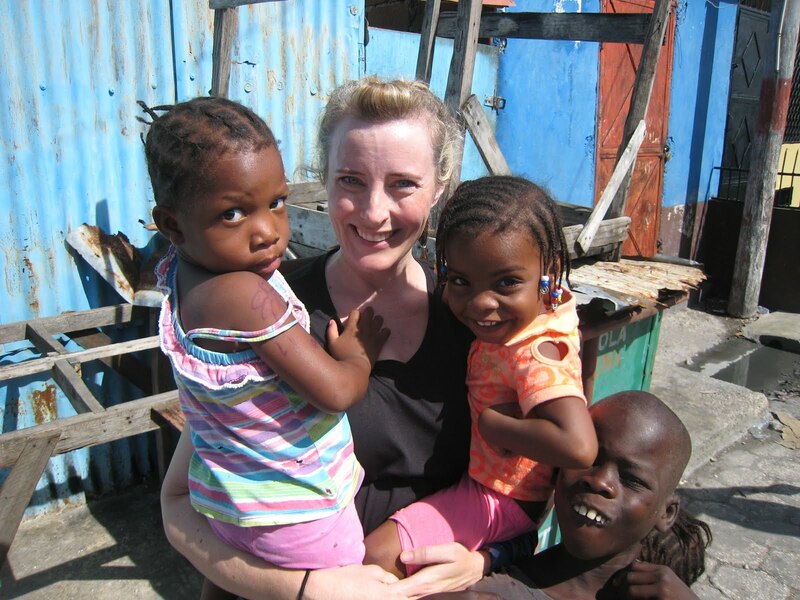 Our ladies unloaded 3 separate water trucks inside the poorest slum in the Western Hemisphere. The homes were constructed out of the best pieces of the local trash. Women and young children met the water trucks expectantly. There is zero freshwater available in Cite Soleil. It is trucked in 6 days a week. After their containers were filled the women and children carried giant 5 gallon buckets of the water back to their dwellings. Several team members helped carry this water, it was difficult and laborious to say the least. I’ve saved the best for last! 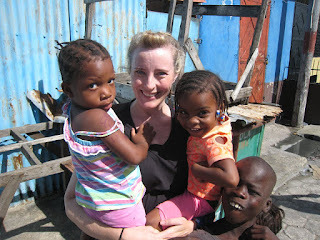 The children in Cite Soleil were among the most precious I’ve ever seen. They chased after the truck yelling, “Hey you.” As we left the Tap-Tap (our truck) they couldn’t jump into our arms fast enough. Our ladies held as many as we could trying to give everyone a turn. Most didn’t wear clothes and those that did were soiled and frenetic. I can’t describe how proud I am to be a part of this team. These ladies gave of themselves and then gave more. 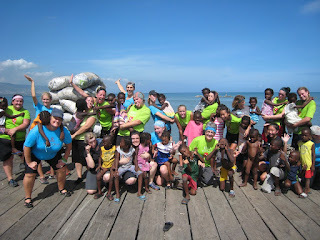 We also got to tour Hope School and Church located in Cite Soleil as well as Terrepromise School. So thankful for these educational opportunities. Several of us wound down the afternoon swimming in a nearby resort pool. Every meal has been on point and the staff have been gracious and accommodating. Tacos for dinner last night, pancakes and eggs for breakfast this morning and finally chicken yakisoba for dinner tonight. We are being well taken care of and covering each other in prayer. Decompressing has been a bit tough given the conditions of Cite Soleil we were exposed to today. Fortunately, God has placed each person here for a reason and to fill a specific purpose. We are encouraging each other and trying to share the love of God to all we meet. Please continue to cover us in prayer as this is only the first day. We would covet your prayers for strength both mentally & physically as well as guidance and protection. We love you all and await what tomorrow may bring. In the Company of our Mighty King. Early in the morning at around 6 am there was a group of about six people that planned to go to a church service. They took the tap tap to the Sister’s of Mercy only to find out that there wasn’t service until 8:30 am because of the Feast of the Assumption, so they prayed with a sister for 15 min and then walked back to the Healing Haiti guesthouse. Eventually the time came around for breakfast at 8 am. We ate an egg scramble, French toast, avocados and mangoes. It was delicious! We left at around 9:30am to go to our first location called the Missionaries of the Poor. There we met Brother Marcal the head of the mission here in Haiti. He talked about his life’s story and about the Mission. He is originally from Kenya. The founder of the Missionaries of the Poor came from Asia and moved to Jamaica. This is where he witnessed 154 people die and felt God’s calling to serve the poorest of poor and the sick. The mission was originally named Food for the Poor then it evolved to Brothers of the Poor and then to its current name Missionaries of the Poor. There are many Brothers around the world, about 500 of them, and twelve locations of the Mission in Jamaica, Haiti, Philippines and Uganda. We spent the morning bathing, nurturing , playing and loving these beautiful children that live at the Mission. 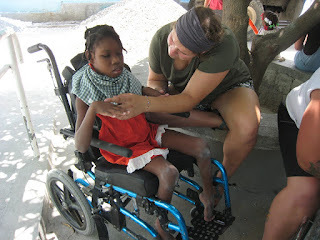 All of the kids had both mental and physical disabilities; it was evident the staff did their best to care for them but as with many situations in Haiti, resources are limited. From there we traveled to an open metal market where we admired and purchased beautiful works of metal art by local artists. Our last stop for the day was another special needs orphanage. We brought several wooden cars and markers for the children to use. There were also colorful noise makers which were definitely a hit. Many of the kids loved coloring the wooden cars and the masks. There was an impromptu sing along with the noise makers that involved some 90s rap, Frosty the Snowman and the theme song to the Brady Bunch. All kids were in great spirits. One little girl was very particular about the colors that she chose. While another boy found it funny to fling cars and see how far they landed. Lastly, we were greeted by a small boy in a wheelchair that looked at each one of us as we arrived and slowly pointed his index finger and motioned us over. The smile on his face was able to get every single volunteer to come over and say hello.